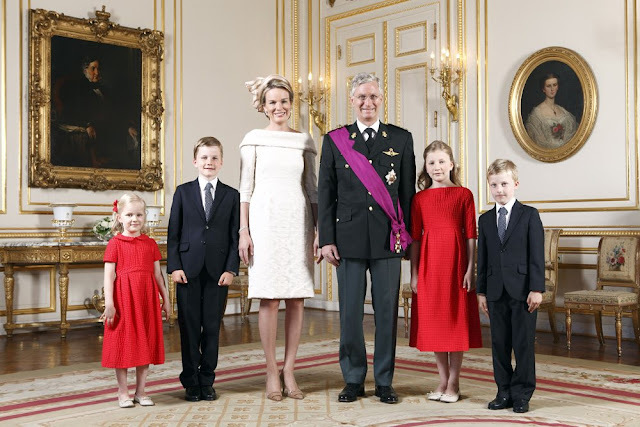 Just 3 weeks ago the Belgian king Albert II announced his abdication from the throne in favor of his son Philippe who became the 7th king of Belgium. Yesterday the 'coronation day' wasn't as ceremonial and spectacular as in the neighbor country the Netherlands (pictures here) earlier this year. There were no royal guests from abroad, there wasn't a real crown and the queen didn't wear a spectacular evening gown either. Besides the fact that the abdication was a short term notice, the Belgian aren't as strongly monarchy-oriented as the Dutch. The country has always been divided, there is a continuous division between the Dutch-speaking Flemish north and the French speaking Wallonic south. The former king has restless months behind his back because he has an illegitimate daughter (the fact is widely known since 1999) who now suddenly insists on having a paternity test done. 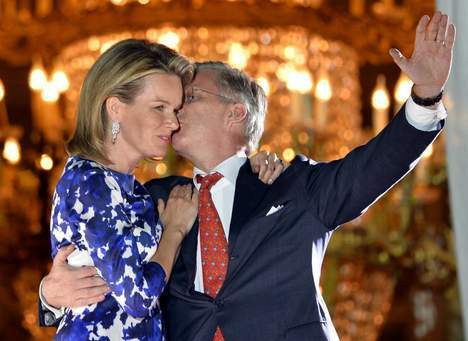 To make things more complicated recently came to light that the 84 years old widow of his brother, the former king Baudouin (Baudewijn) didn't pay taxes about a huge part of her fortune. just a few of the possibilities why they choose for a rather simple and not-too-expensive planning for the day. The very elegant, 1950's style dress which seemed rather 'heavy' for a really hot day was made of a silk-cotton mix fabric with brocade structure. The main feature was the beautifully shaped neckline. I really liked the wide, folded back shawl-collar which was open at the back and revealed a button closure. The waistline was raised in the front. 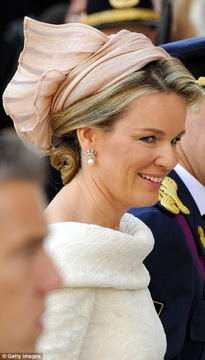 With the 3/4 sleeves and specially designed box-hat it was a very Jacky Kennedy-like outfit. 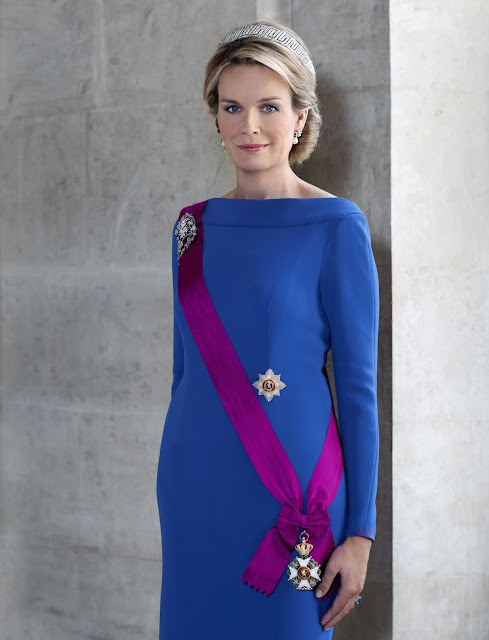 The dress was also used to make the official pictures of the new king and queen. 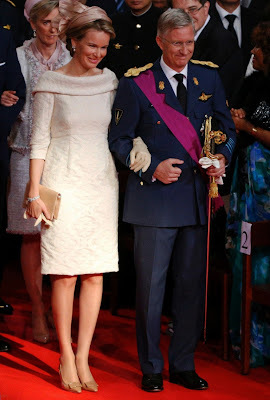 I kinda expected a more colorful, elegant evening dress like queen Maxima's for this occasion. Edit: the pictures are released and she looks beautiful in a royal blue evening gown! Scroll down for picture. Later on the day the queen changed to another, a more 'summer-proof' Natan dress. Although the dress had pretty, vividly contrasting red and pink colors, I felt the interesting pleated details got lost between the busy abstract patterns. It is a pity she didn't use the opportunity to show dresses from different Belgian designers. I'n sure a Dries van Noten dress could have been a nice contrast to a Natan dress! - has a degree 'Master of arts in Political Science from Stanford University? - he was an army pilot? - he was trained as a paratrooper? - he was almost 40 years old when he got engaged to Mathilde who was 25 years old at the time? - at that moment he wantend to make just one thing clear, this was not an 'arranged' marriage: "We weren't introduced to each other. If someone is telling 'I introduced her to him' he is not telling the truth. I just saw her standing and I wantend to talk to her." - he was 48 years old when his youngest child was born? - he is very devoted catholic?